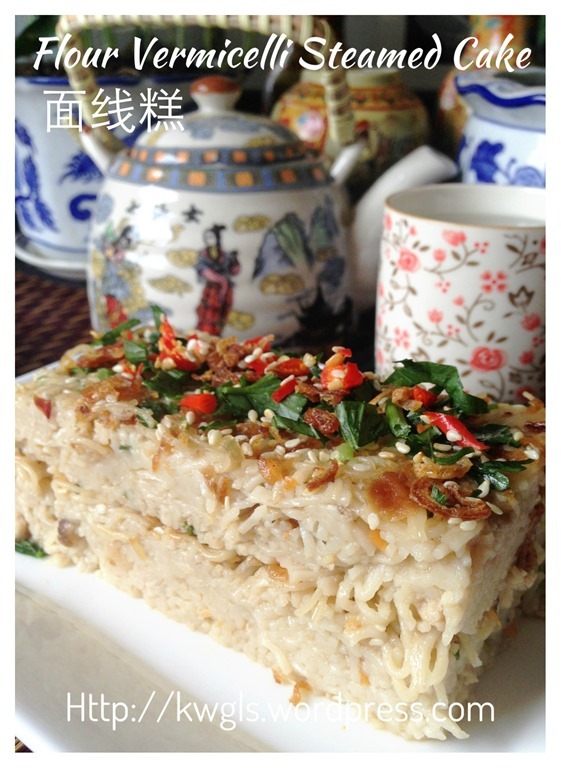 I don’t know how many readers have eaten this steamed “noodle” cake before but I have my fair share of this kuih when I was in Sarawak. My mother in laws used to prepare this kuih years back when she bought a set of new utensils. She said the cookbook provided came with this special recipe. 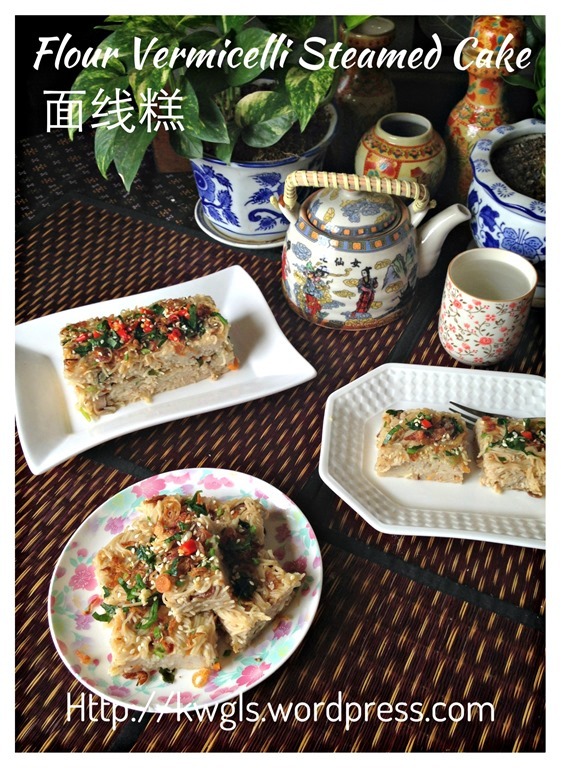 A week ago, one Facebook friend asked me to help her to translate her recipe (from a newspaper cutting from Sarawak) to English, that reminded that I have not eaten this kuih for a few years. 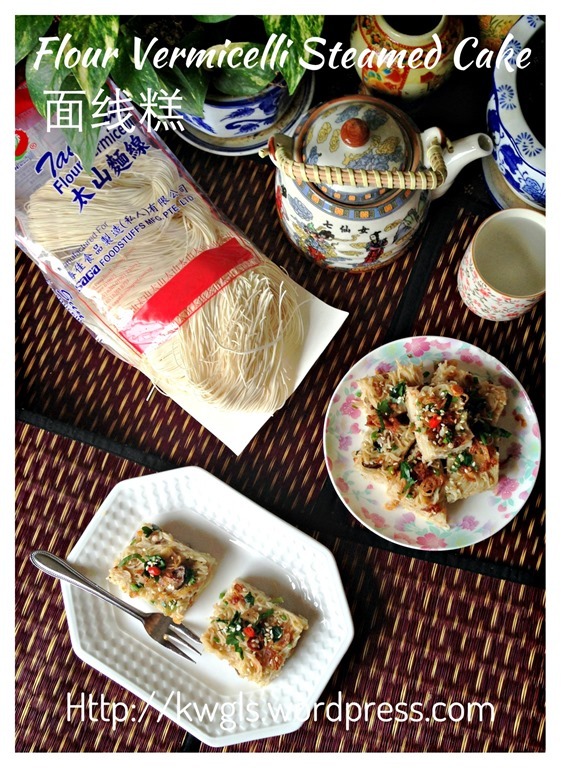 Since my mother in law is with me in Singapore, I have decided to prepare this together with her. 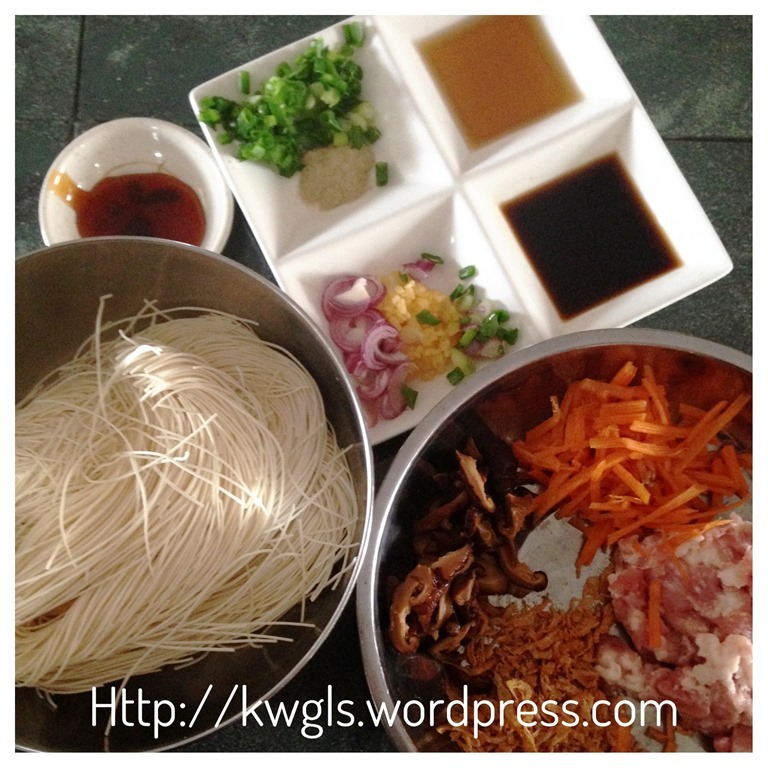 The recipe here is our own version of mee sua kuih . 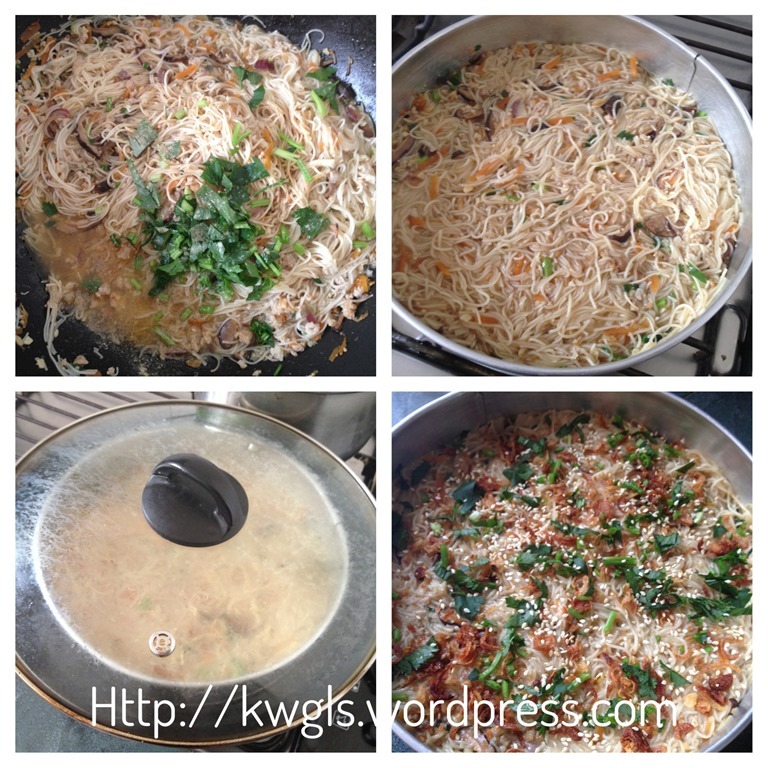 Preparation is not difficult and as it is a savoury dish, variations are many.. For most of the ingredients, you can increase or reduce the quantities to suit your taste buds. When I posted the picture in some Facebook Groups, some members in Singapore said that they have taste before in Singapore and surprisingly, in a Central Business District kuih stall at Raffles Place.. 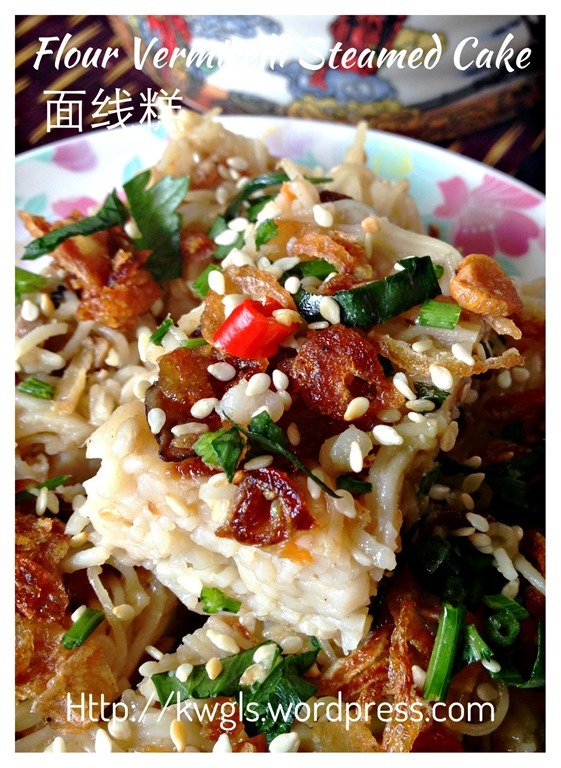 Most have totally never seen or heard of the kuih, and this is how I described to them about the taste and texture: “ It is just like a plate of fried mee sua but in different form” or “It taste like steamed yam cake or steamed carrot cake (depending on what you have put) but with a noodle texture”. 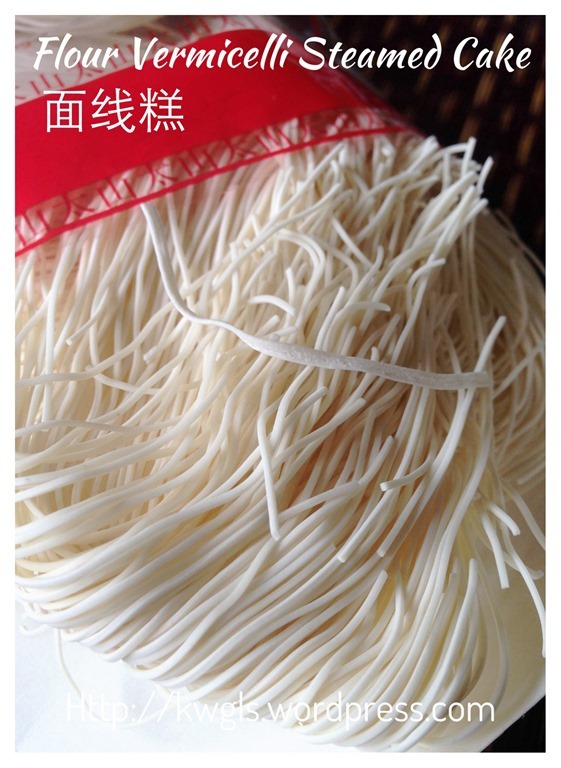 House chefs who cooked flour vermicelli will know that this noodle is very sticky in solid form and most of time, there were used only in soupy noodle dishes. 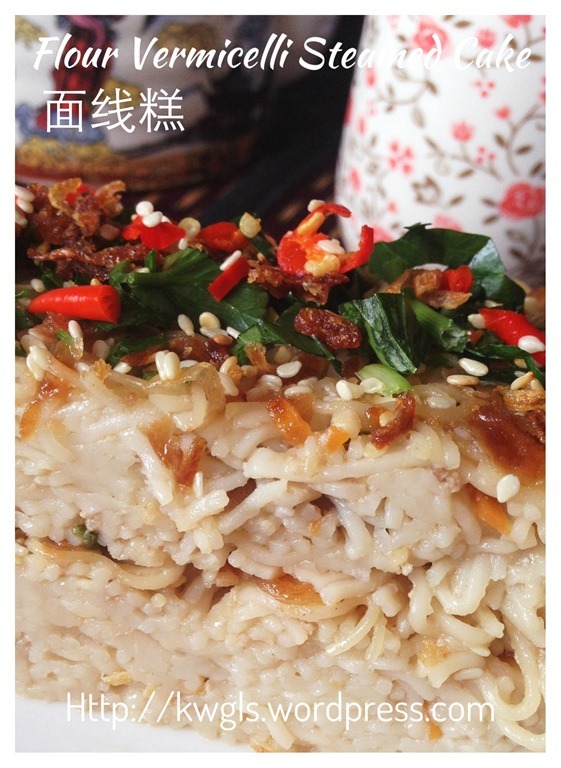 By the same logic, with adequate but not too much water, flour vermicelli will expand and “adhere” to each other, making it possible to cut into pieces like any other cakes. Adding too much water will reduce the stickiness and unable to form the kuih. That is the basic logic behind the preparation of this kuih. Lightly greased an 8 inches diameter round baking tray. 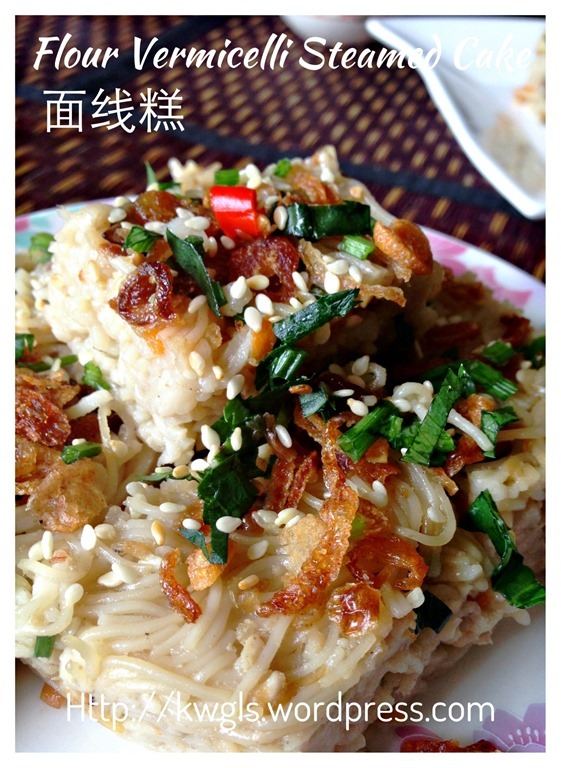 In a pot of hot water, blanch the rice vermicelli until soft (About 3-4 minutes depend on brand). Drain and set aside. Immediately when cooled, it will become a lump. In a hot pot, put 2 tablespoons of cooking oil, sauté the chopped garlics/shallots and mushrooms until fragrant or golden brown. Add the julienned red carrot, small shrimps and stir fry for 1-2 minutes. Add the minced meat (for the minced meat, to avoid it forming lumps when stir fried, add a few tablespoons of water before stir frying). Stir fry until well combined. 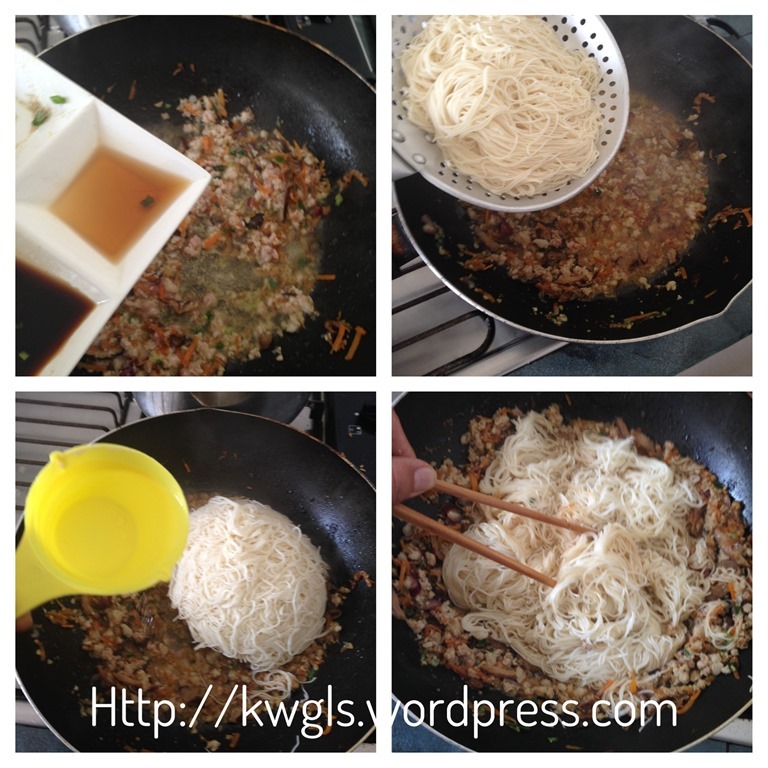 Add all the seasonings (Chicken stocks, white pepper, sesame oil, light soya sauce) and stir fry until well combine. 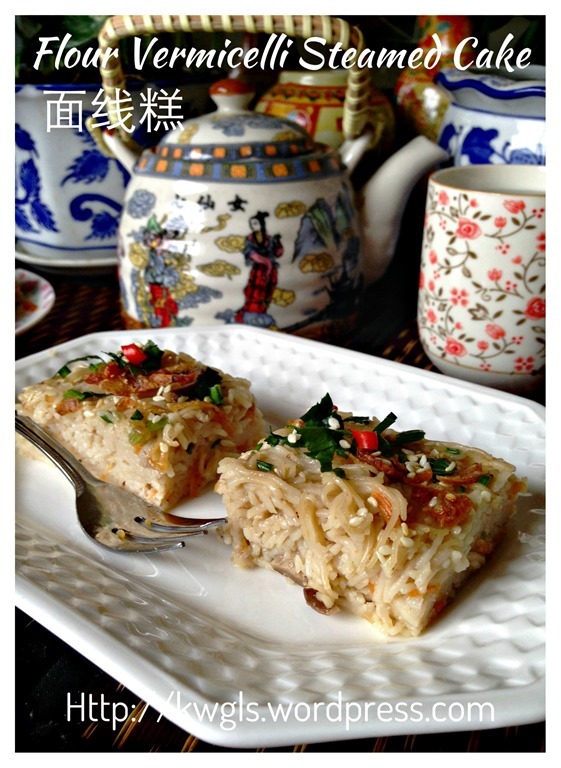 Salt may be added to enhance the taste but it depends on the type of flour vermicelli that you used. 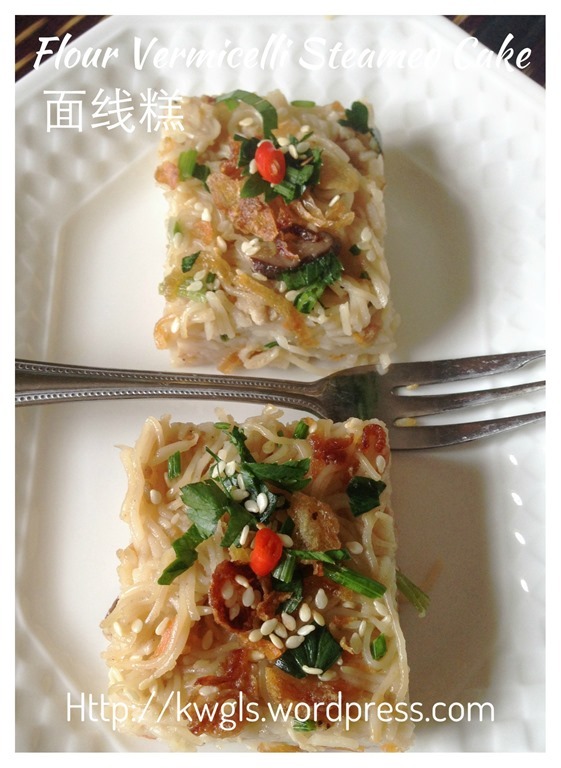 Some flour vermicelli are very salty and salt should be omitted. However, you can still adjust the taste at the later stage. 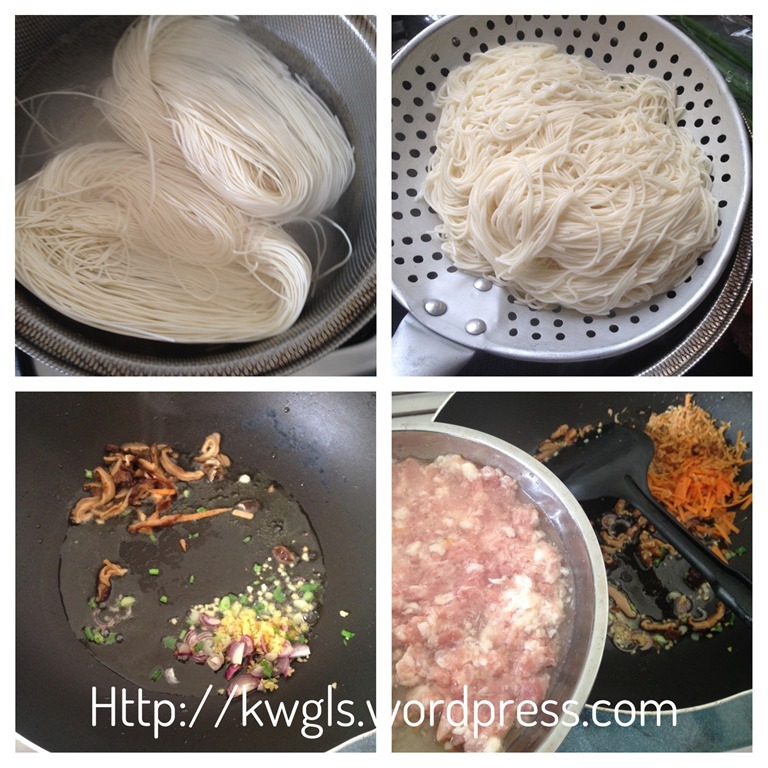 Add the blanched flour vermicelli. Add adequate water just to roughly cover the vermicelli (my experience is about 2-2.5 cups of water). Stir until well combined. 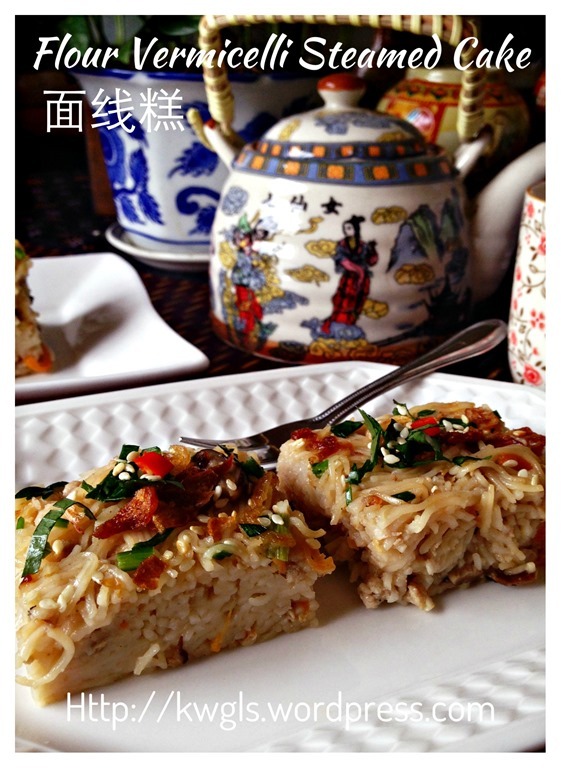 If it is difficult to stir, use a pair of chopstick to stir it until well combined. It is advisable that at this stage, you use a spoon to taste whether the seasonings suit your taste bud and do necessary adjustments in this stage. 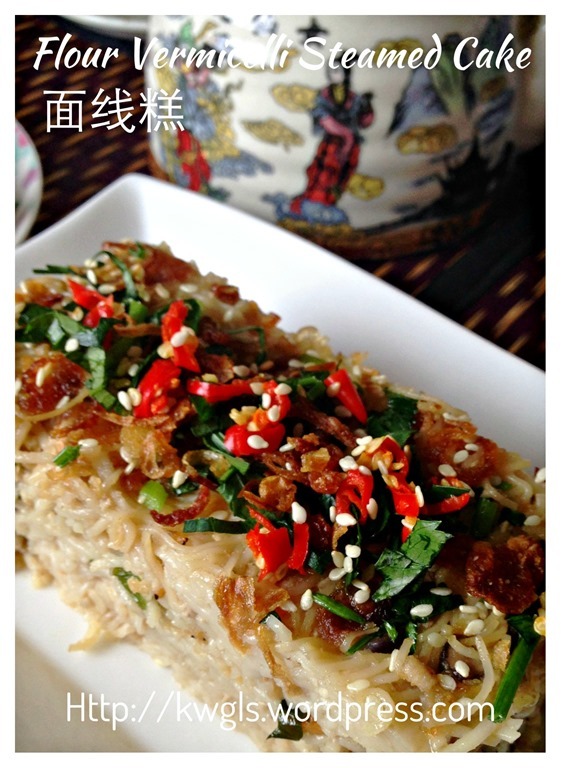 Add in some chopped Chinese celery, stir well and transfer to a lightly greased baking tin and pressed until compact. Steamed in a steamer under high heat for 15-20 minutes until the kuih dries up. Note that when hot, it may be very soft and still shapeless. When cool, it will set and become a kuih like structure. If it does not set, it will mean that too much water is added. Add in the garnishes (chopped Chinese celery, sesame seeds, chilli and fried shallots) while it is hot and use spoon to press it. Cooled completely before cutting into small slices. 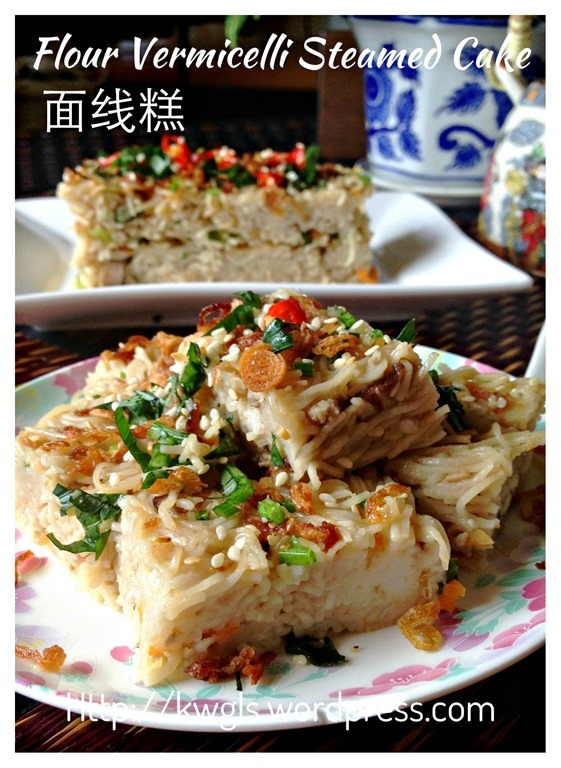 Pardon me for not being humble that the whole family loved this rather unique kuih.. Once again, if you have never taste it, it is just like eating a plate of fried mee sua in another form. Whether it is nice or not will very much depends on your adding of seasonings to suit your family’s taste buds and how you sauté the ingredients to make it fragrant. Do give it a try.. 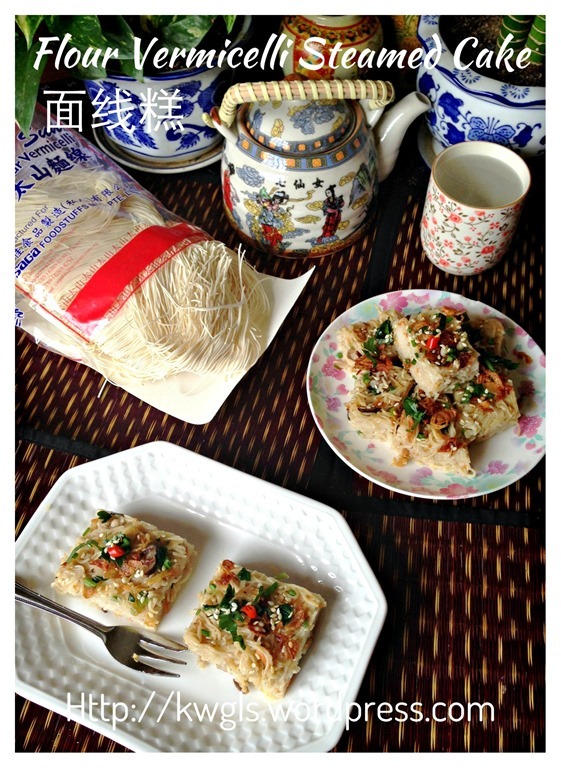 This entry was posted in Chinese and Asian Cakes and Snacks, Food Preparation Series, Party snacks or finger foods, Snacks and tagged 8, 面线糕, flour vermicelli steamed cake, GUAI SHU SHU, Guaishushu, kenneth goh, mee sua kuih, postaday. Bookmark the permalink.